You can access this section by clicking Run scripts, in the Welcome screen. In this section you can type special custom commands that allow you to perform many kinds of tasks to disinfect and repair your pc. Click here to learn all about these custom commands. You can also copy lines from the UVK log and paste them in the text box. Corresponding registry entries and files will be deleted. Click here to learn how it works. 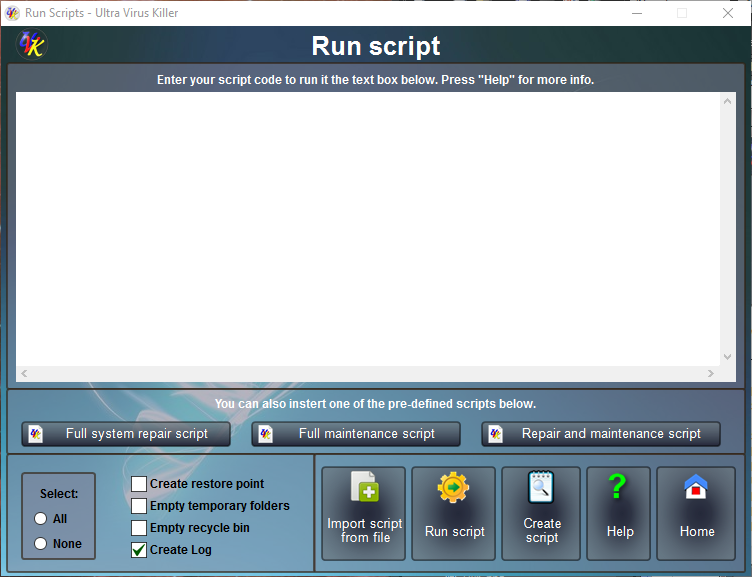 To import commands from a UVK script, click Import commands from file, navigate to the path where the script is located, click to select it and then click Open. The file content will be added to the text box. Create system restore point: We recommend to leave checked. If you uncheck this option, no restore point will be created and you won't be able to undo the actions performed with the commands execution if something goes wrong. Empty temporary folders: Uncheck this option if you don't want to perform this action. Leaving this option checked, UVK will empty the temporary folders for all users. Locked files will be scheduled for removal on reboot. Empty recycle bin: Uncheck this option if you don't want to perform this action. Create log: If you uncheck this option, no report of the commands execution will be created. We recommend to leave checked, so you can see if everything worked as you planned. When ready, click Run / Fix listed. You'll be prompted to confirm to execute the listed commands. If you click No, the commands won't be executed. If you click Yes, UVK will execute the listed commands one by one, from the top to the bottom, after performing the selected extra actions mentioned above. A progress bar will show you details of the current action. You can use the buttons in the Insert group if you want UVK to automatically create system repair and maintenance scripts. Clicking these buttons will insert the code to the commands text box. After this, you can delete or add more commands or lines from the UVK log to make exactly the script you want to execute. This feature was created to save time when the user just wants to run the standard repair / maintenance UVK scripts. To create more complex scripts, you should use the Log analyzer. When the script is ready, click Run / Fix listed and confirm to run the script. To return to the Home section, click Home or press Esc.